Before the Egyptian presidential elections in May 2012, the Muslim Brotherhood candidate, Mohammed Morsi, proposed a 100-day plan for reinvigorating the economy and social and political situation of the country post-revolution. After he was elected in June, Zabatak, an anti-corruption and transparency advocacy group struck on an innovative idea to publicly monitor Morsi's performance. 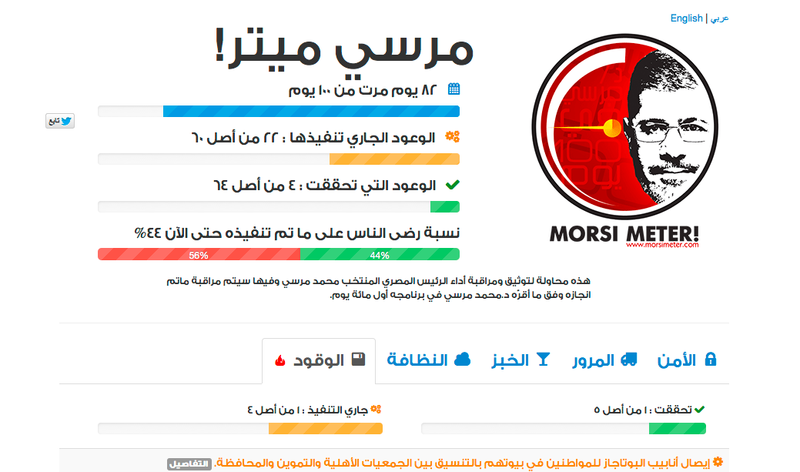 Modeled on the Obamameter, and other similar projects in other countries, MorsiMeter is a simple website tracking Morsi's fulfillment of his promises in the five areas of security, traffic, bread, cleanliness and fuel.